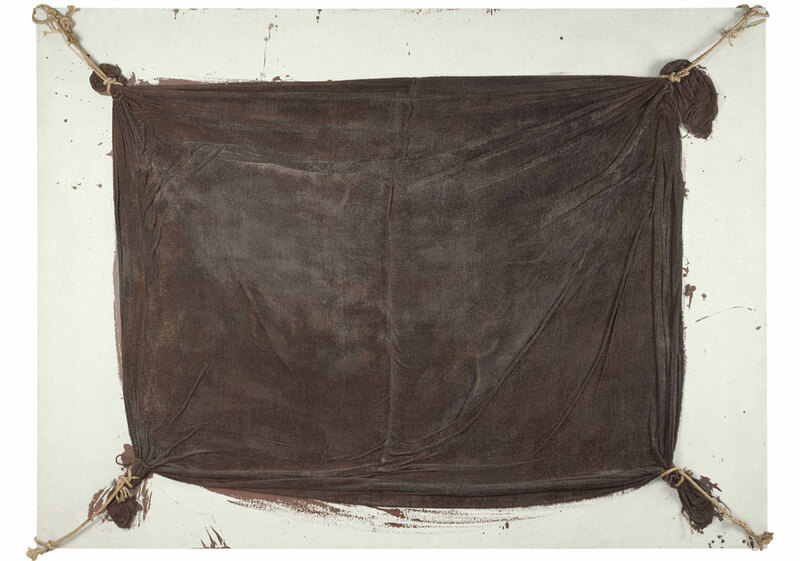 Antoni Tapies, Toile marron tendue, 1970. Técnica mixta, sobre lienzo y madera, 200 x 270 cm © IVAM Institut Valencia dArt Modern. VALENCIA.- We find here a term that contains many shades of meaning. It denotes membranes between interior and exterior; wounds that link the familiar with the unfamiliar; brackets that suggest closeness and distance; summits where one peak touches another. The boundary is on this side and that of a frontier: it is what separates our dwelling place from the rest of the world. But it is also ourselves: that which we are intimately made up of. The exhibitions that will be inaugurated at the IVAM in Valencia on 28th May (and will remain there until 15th November) revolve around these ambiguous and evasive topics. Confines is divided into tour chapters, curated by Consuelo Císcar Casabán, Vincenzo Trione, Aaron Betsky, Robert Wilson, Robert Storr and Francesca Pietropaolo. These are different sections, like different speeded-up sequences closely linked to each other. Pieces of a mosaic that strives to explore the interconnections between languages and the dialogue between the arts and the territories of the present. An acknowledgement that attempts to describe the state of affairs of contemporary poetics and, at the same time, tries to prefigure the future. We rediscover the value of militancy and commitment, beyond ideological influence and naturalistic options. We recuperate the dimension of critical consciousness in the season of disenchantment. The works selected read and interpret the changing, convulsive and contradictory scenarios of our time. They document and reinvent moments of the reality we live in each day. Which, contrary to what has so often been claimed, is not an expression of a fluid modernity, but is marked by the continuous re-emergence of walls. On the one hand we aspire to design urban landscapes without duplicity. On the other, we still feel the desire to restore limits and obstacles. We build cities in which many barriers are erased, but we continue to design buildings that reaffirm the importance of obstacles. Similar oscillations run transversally through this project, whose first part comprises a sort of historical prologue (Historias del confín [Histories of the Boundary], curated by Vicenzo Trione and Consuelo Císcar Casabán), which addresses the way artists have rewritten the figure of the boundary, by arranging a complex alphabet of abstract lines. This is the premise on which the next two paragraphs are based (Geografía del confín [Geography of the Boundary], by Aaron Betsky, and Confines del tiempo [The Boundaries of Time], by Robert Storr and Francesca Pietropaolo), who investigate the emergence of some planets and the wrapping motif, conceived as a form of protecting them from outside incursions. Finally, the prophecy of Visiones de confín (Visions of the Boundary, by Robert Wilson), which offers utopian contexts in which all delimitations are destroyed. This is an exhibition project that attempts to make a reflection about the very identity of our era. Of an era of boundaries, as Salman Rushdie has written. The exhibition will contain site-specific installations by Roberto Pietrosanti and Gianluigi Colin. This exhibition is articulated along a line understood as the boundary par excellence which does not follow a chronological order but is arranged according to themes, creating a sequence of monographic stanzas similar to little secular cathedrals. It is a lyrical exhibition itinerary that goes through some essential articulations to research the dialogue between realism and abstraction, to go from the visible to the invisible, from the presence of the world to its disappearance, to an unexpected final revelation. We are about to embark on a journey from the earth to the heavens, from Mark Rothkos erased places to Anselm Kiefers imperfect constellations. Among the artists present in the exhibition are: Mark Rothko, Barnett Newman, Frank Stella, Sean Scully, Daniel Buren, Pierre Soulages, Gerhard Merz, Lucio Fontana, Miquel Navarro, Alan Charlton, Dan Flavin, Anish Kapoor, Alberto Burri, Antoni Tàpies, Agostino Bonalumi, Bernar Venet, Carl Andre, Gordon Matta-Clark and Anselm Kiefer. This exhibition will include a selection of recent videos by a total of eleven artists, from consolidated creators to emerging artists from Europe, Asia and North and South America. Focusing on temporary current works, the exhibition will show how artists today deal with the experience of time and its limits, insinuating in doing so some of the emerging patterns although without attempting to provide a complete catalogue of them. The videos selected will underscore the capacity of grasping the figurative, the evasive and the evitable to evoke moments of unlimited time: that is what we are left with and therefore what is recuperated once again. They all share concern about the disappearance of frontiers and the collapse of temporal linearity practised by artists of different generations and cultures, also with diffe rent formal, co n ceptual and poetic approach: Jaishri Abichandani, David Claerbout, Harry Shearer, Jonas Mekas, Liliana Porter, Olga Chernysheva, Patricia Esquivias, Sun Xun, and ZimmerFrei. This is an itinerary through installations that investigate the emergence of some planets and the wrapping motif, conceived as a cavity to protecting them from outside incursions, made by artists and architects together to reflect the boundaries that exist between painting and architecture, as we can see in the work of: R&Sie(n), Alexander Ross, Greg Lynn, Los Carpinteros, Tom Sachs, Marcos Novak, CoLoco, El Anatsui, Elliott Hundley, Carsten Höller, Erwin Redl, Mark Bradford, Teddy Cruz, Franz Ackerman, Ball-Nogue, Driessens Verstappen, Erwin Wurm, Frankfurt, Lynn, McDowell & Imaginary Forces, Dinisio Gonzàles, Antony Gormley, Howeler + Yoon, Hussein Chalayan, Jurgen Mayer H Architekten, Joris Laarman and Demakersvan, Hyunkoo Lee, Ryan McGinnes, Julie Mehretu, Julius Popp, Mark Price, Matthew Ritchie, Jennifer Steinkamp, Esther Stocker, Teddy Cruz, Thurkal and Tagra and Chris Woebkin. The exhibition will be accompanied by a sample of installations that offers utopian contexts in which all delimitations are destroyed, with works by Christopher Knowles, Andrea Crews /Maroussia Rebecq, Dash Snow, William Pope L, Matt Leines, Jonathan Meese, Megan Whitmarsh, Mark Manders, Japanther, Misaki Kawai Studio, Ed Templeton, Alexander Petlura, PlanningToRock (Janine Rostron) and Vadim Fishkin.